Dine Out is our new addition wherein people who like to eat out can share their experiences with our readers about the place be it a restaurant, café, dhaba, pub/bar or even a night club! This section will be a true reflection of your views about the cuisine, the decor, the ambience, service etc. We encourage our readers to send their dining out experience with photographs to info@mangalorean.com . The mangalorean.com team will review them and publish in this section. This coastal city is a gourmet�s delight. It has lured people from all over the world, it has bowled over Americans, British, Australians and from all parts of the world with its delectable local delicacies, but the time has come for the local Mangaloreans to get hooked on to the international cuisine as well. The latest fad that is moving them is the Arabic cuisine. They are hunting the places that are serving the spicy, wholesome and tasty Arabic food. The city has seen in the recent past a number of eateries have started a counter to cater the Arabic food. The first one was to appear in the city was in 2005 when Pop Tates was opened in the Emjay�s complex in Balmatta, �The Arabic food basically that the Mangaloreans liked included Shawarmas, Rotissrie chicken and spicy Kababs deep fried. People did like them and the demand was so big that my eateries exhausted the stock early night by 9pm which sent many late night diners without having a bite� says Mr. Anwar Manippady the owner of Pop Tates. But much water flowed beneath the Nethravati bridge since then and Arabic eateries have started popping up everywhere in the city. The giant Shawarmas with Iranian roties stuffed with grilled Chicken shredded and mixed with generous cubes of onions, shredded cabbage, pickled carrots and special Iranian chillies served with a thick layer of mayonnaise and spicy home ground sauces, began to tickle the taste buds of the Mangalorean gourmets day in and day out. Today the city in the night is different with scores of people unraveling the mystic Arabian Shawarmas at throwaway prices like Rs. 35 per roll. �They are quite sumptuous, they go well with any cola and a piece of rotisserie chicken, my weekends will never be complete without this combination after a couple of beers� said Vivek Mathur a techie who was drooling over his dinner in Chicken Lagoon in Bejai on Saturday. His Girl friend Melanie said before they used to like Chinese and were frequenting Pizza joints but now they both like to gulp down Arabic meal over a Cola and go to their solitude fully contented. �On a typical weekend nights I sell about 220-250 Shawarmas in my outlet, on a week day nothing less than 175-180 of them. They are quite easy to prepare, the ingredients come ready made. We get the rotis from Kerala where the supplier imports it from Iran. The boneless chicken steaks we prepare ourselves and roast them on our open ovens to the required grade. The onions and other ingredients are locally available, but we need a perennial supply of gas to run the oven� said Mr. Ibrahim who is the Shawarma specialist in one of the joints in Urva. When it comes to rotisserie chicken the cost is heavy, they come at Rs. 180 for full chicken but it requires two persons to fully consume it, �That way it is so good, it is a full meal in itself, I and my friend Raj almost every weekend take one full Chicken in the night with Two Shawarmas and our bill comes to only Rs. 250� says Neville D�Cunha of Bangalore who is working in one of the European car showrooms in Kankanady. According to Mangalore City Corporation health department officials, there are atleast 70 outlets that have started serving Arabic food and more licences were on the pipeline. Rathnakar Shetty - owner of an Arabic eatery in Valencia said �My establishment is brimming with customers throughout the week, I sell more carry home packs than I serve over the table, on Weekends my hands are full and I consider myself lucky if I can get my hands on one of my own Shawarmas for my dinner.� I wonder if there are more dishes of Arabic origin that is presently not being served in Mangalore, I will find out when I go next time to the Gulf" muses Naveed a Shawarma joint owner in the city. Kindly advise on where is the shawarma shop in valencia? As I am looking at the photos, this place looks badly maintained. Grilled chicken is not looking nice. I agree with Mr Drona. Most of the restaurants selling these items not hyginic. Vegetables not washed properly, the curd sauce is stale some times and the quality of chicken is bad. Out of 10 times eating shawarma, 3-4 times we catch up with stomach upset infection. I find only two joints Pop Tate in Balmata and Chicken Tikka in Lalbagh good. Others not upto the level. 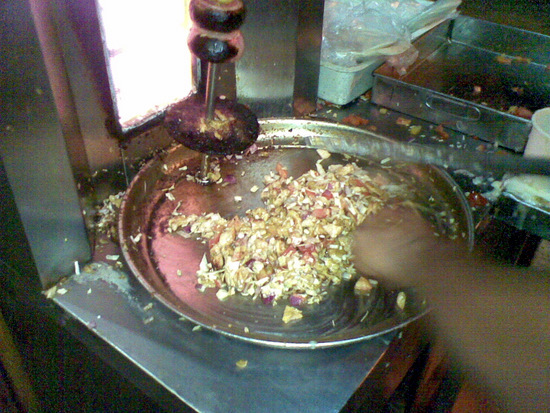 The one in Shedigudda uses very hard kubus(shawarma). In some of the places, dirty water flowing in the open drainage outside and flies attacking food. The one in Urva smelling mud in the carrots packing with the shawarma. I agree with this observation. Hygiene is some thing to worry about. In fact most of our restaurants do not have the basic concept of hygiene. Waiters dip their fingers into the water glasses before serving for example.I do not wish to give graphic details of the lack of hygiene here. This is basic Arabic Street food doctored to Indian Taste buds. Arabic food is basically bland / mostly grilled and consumed with dips (Hommuz / Muthable etc) and lots of Salad. Outstanding Kebabs / mezzes / etc. are Iranian / Lababese / turkish / Moraccon and vaieties of Biryanis known as majboos / Ouzi are superbley delicious. Hope some day i can contribute an article on this. However, the write up was good - but unlike the real arabic joints in the Arab world / Europe / US the one's in Mangalore lack basic hygeine. A saga of negligence, horror, pain and bravery! A car from the garbage bin! Gatti Kudru - Be there to believe it! Eradicating plastics not so easy!